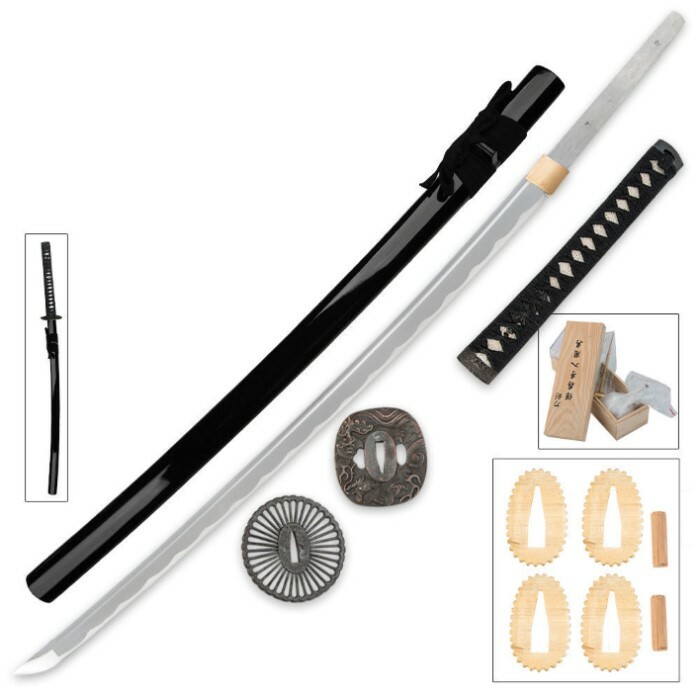 The ultimate fully functional samurai sword kit! Perfect for both beginners and novices, this package makes a great gift. The selection of quality katana parts lets you build and customize your own samurai sword, or customize swords from your current collection. Each blade is handmade and as such the blade's tang will vary slightly in size and shape among our stock. The included handle has been custom fitted to the blade's tang by the factory. This is done so that the pre-drilled peg holes will line up correctly once assembled. The included guards have not yet been custom fitted to the blade and may require some light tooling. The guard you select for your build might need to be filed slightly for the proper custom fit onto the blade's tang. If the fit is too tight to position the guard where needed then do not use a mallet, instead make the guard's hole slightly larger using a metal file. Move the file back and forth evenly though the center of the guard and test the fit as you go. It does not take much tooling to get your guard custom fitted to the blade. The amount of tooling will vary from kit to kit and the guards you receive might not need any adjustment during assembly.